For us it's never hard to stay productive in the summertime. The winter is another story…the cold just shuts us down. But in summer the days are long and bright, we can cut wood out on the deck, and when we've got a small enough load of boxes to ship, we can walk them to the post office with the aid of a huge Ikea bag. 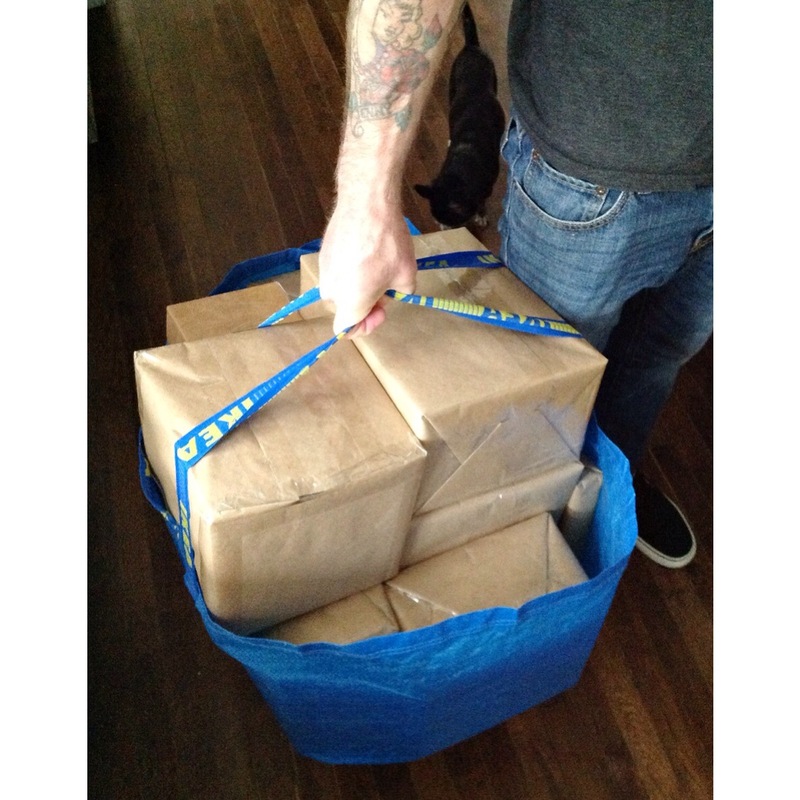 We love Ikea bags! This past weekend was a big work weekend. On Friday and Saturday we shipped a bunch of orders, and spent the rest of the time working on the batch of orders that will ship over the next couple of days. Our goal was to have all open orders out this week, and so far we are doing really well. Every so often theres the obligatory pause for puppy cuddles with Carlos and Lieutenant Dan. Oh Jeeez, that little guy is really one of the family now. We've had him now for three weeks and it feels like we've always known him. Boy do we love that little guy! And to celebrate our busy mid-summer we're having a big Summer Sale in our shop. We seriously love making all of these amazing sweets every day…without even firing up the oven. If you wanna get in on the sweetness just use code SWEETSUMMER in the shop and you'll get 20% off your entire order. This is way at the top of our list of favorite things to make. 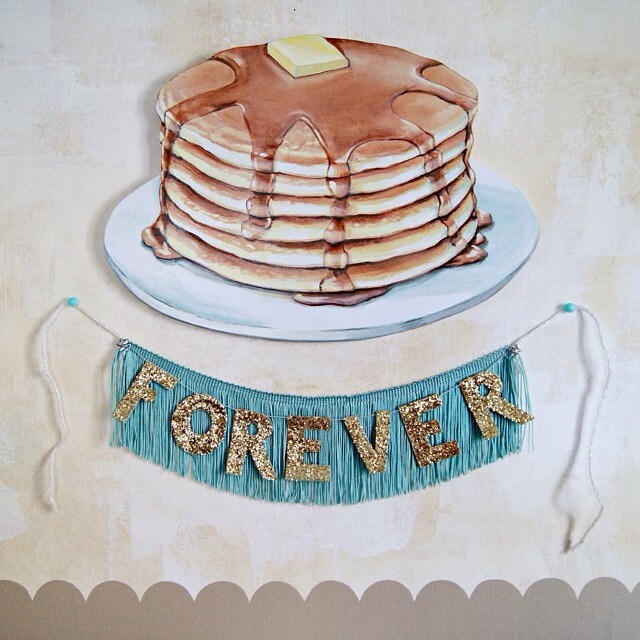 It's just so cool to see this giant plate of pancakes hanging on the wall. 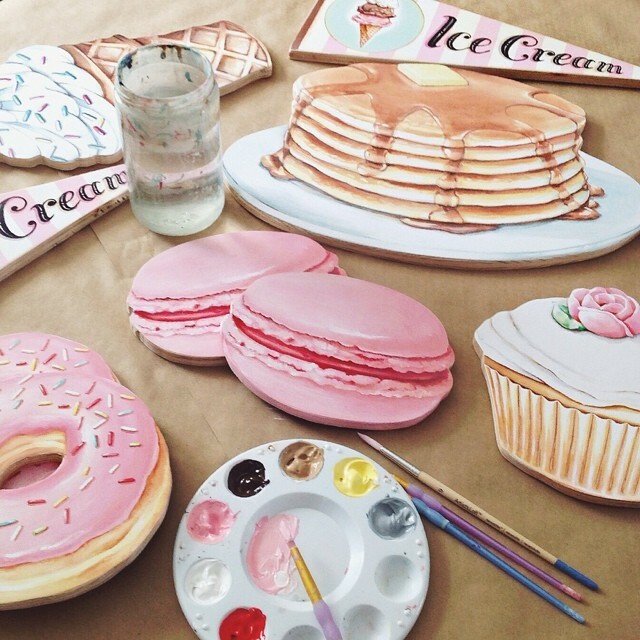 And no lie…fair warning…hanging this on your wall will make you crave pancakes. We hung ours with the addition of this Forever banner by FunCult. We've had this banner for a long time, which was made by our friend Caitlin of FunCult. There have been copycats of her design, but Caitlin's is the bona fide original. Clearing out all of our open orders means that we'll have some time to work on designing brand new pieces…which is of course, our favorite part of the job. Another favorite part is when people order big groups of our stuff and decorate their entire space with Everyday is a Holiday. 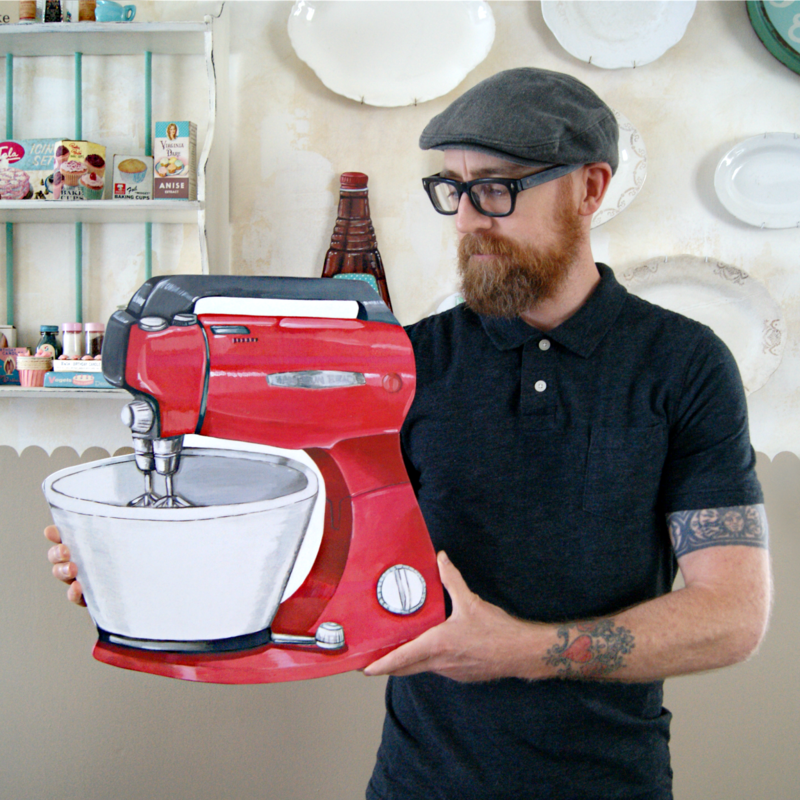 This big red mixer, and six other large pieces are headed off to a home where they'll hang in a kitchen decorated in pinks, pale greens, and red. We can't wait to see pics! Yesterday the mailman delivered the best surprise package from Chicago. No, not the band…the place. And the specific person from that place is our super sweet, super talented, super hilarious friend Natalie Slater of Bake And Destroy. We've blogged about Natalie before…we even participated in her Bake & Destroy Blog Book Tour, and made one of our favorite recipes from her book: Bake & Destroy, Good Food for Bad Vegans. The package was stuffed with all sorts of amazing things! 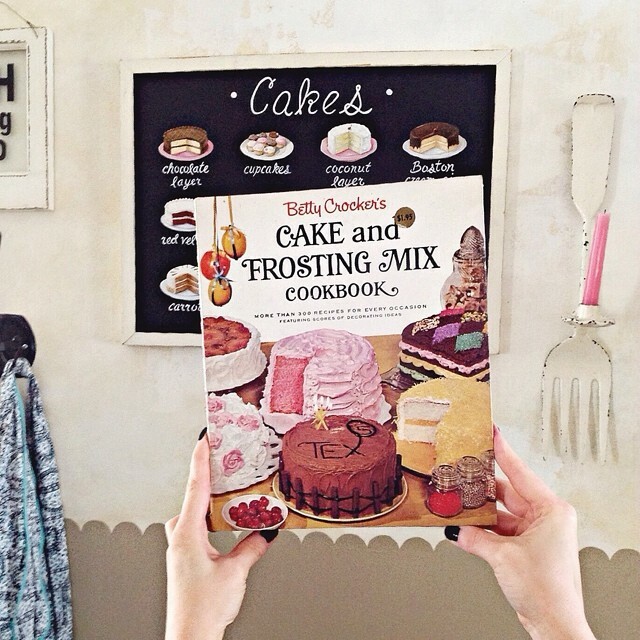 This here happens to be one of my all time favorite vintage baking books…which I had lost to Hurricane Sandy. I'm so happy to have it in my hands again! Natalie didn't know I'd lost this book...she just knows ME! So darn sweet of her! 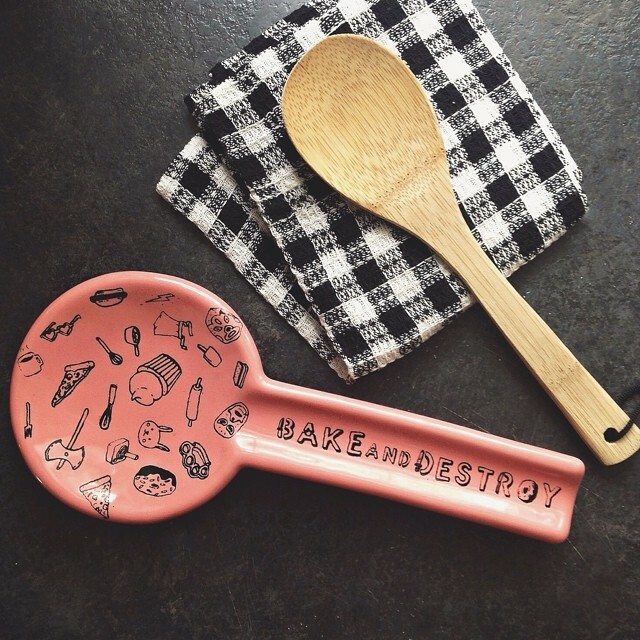 Also in the box, this ridiculously cute Bake And Destroy spoon rest handmade by Circa Ceramics! We adore it and will use it every night! 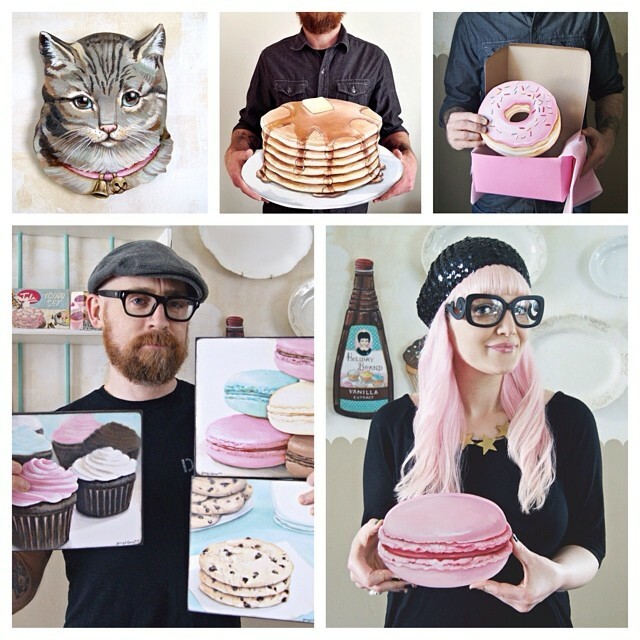 you have to check out Circa Ceramics on etsy, they have so many fun items. I love their graphics so much…sketchy yet perfect...precise and doodley at the same time. And this is just too too cute…a candy chain kit! So sweet! It makes a 5 1/2 ft garland! Perfect for a party table. Each link could work as a napkin ring for a sweet table setting. There were so many great things in the package which I will be sure to share soon. Today I just wanted to pop in and say hi! We have so many irons in the fire. We're trying our best to do a little bit of everything…work on orders, ship, make new art, and also chip away at house projects. 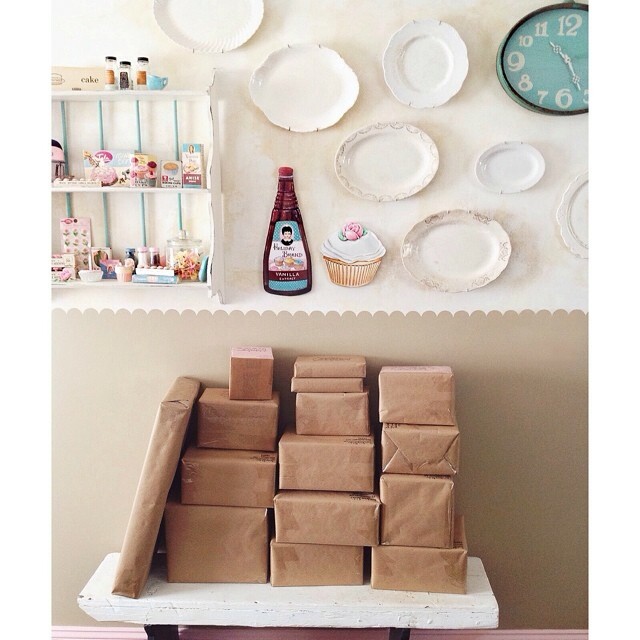 We still haven't finished painting the moldings pink…there are not enough hours in the day. But we are loving how it looks so far! Cannot wait to finish, and start the living room! I always love your stuff and your cat's remind me of my cat. You guys are super talented and I look forward to your posts! You two are just ridiculously talented!!! I just made a few doughnuts from your book to send my daughter. They're hanging in a mobile for her little kitchen! Thanks for the inspiration... You guys rock!